This book is for anyone who wants to learn programming on embedded systems and understand key concepts such as GPIO, PWM, and Bus. It is intended for programming beginner who is willing to work on electronics projects and basic IoT applications. 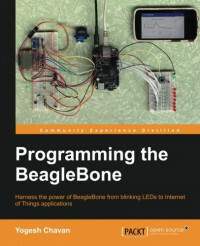 This book will be helpful to BeagleBone owner who wants to quickly implement small-scale home automation solutions. Some hands on is expected on C or Python. Some familiarity with electronics is helpful. However, it is not essential.